Photoshop: CS5 won't print to 11"x17"
Just installed the adobe updates, but problem persists. 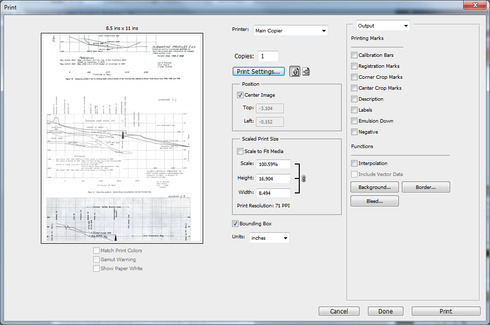 You'll need to change the paper size somewhere in the "Print Settings" dialog. It's in there somewhere, but different printers have the paper size hidden in different places, so it may take some searching. Luckily I still have CS4 installed so I can work around this, but it should work in CS5. Thoughts? Do you have the latest version of the driver installed? It was just released a couple days ago. 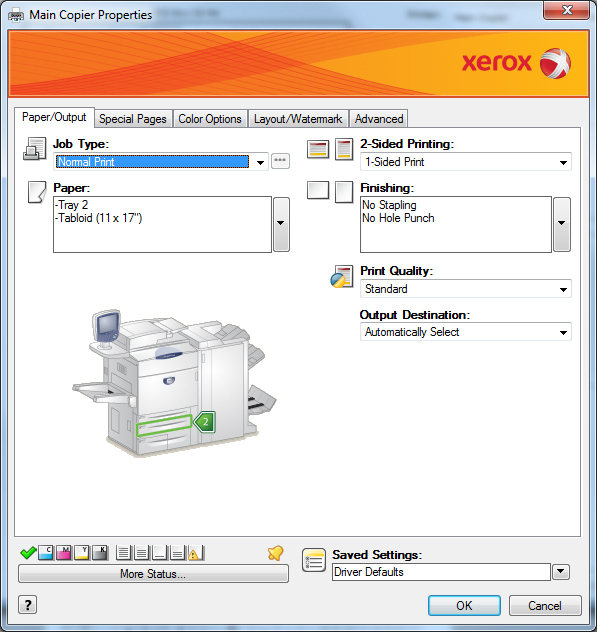 After much toil and struggle with this same issue, I have discovered the answer to changing the print size in the xerox dialogue box! 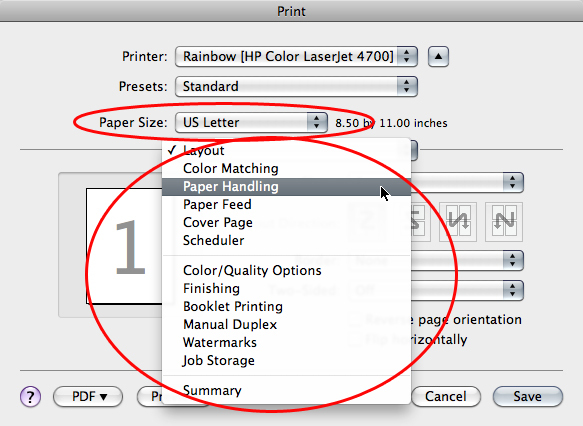 You must click the arrow next to the paper type box in the xerox menu and select "advanced paper selection." Under "Paper Size" select tabloid. Seems if you don't specify here, photoshop doesn't read the paper size. 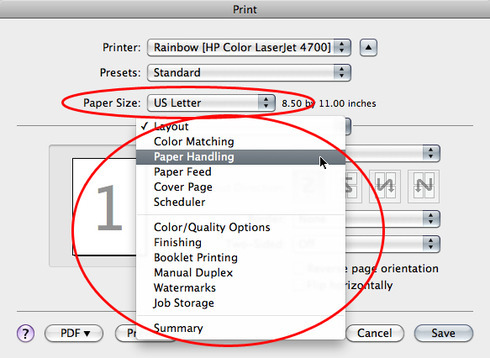 Photoshop only gets the paper size from the printer driver -- if the driver is not recognizing the paper size, then the driver won't tell Photoshop about it. It's kinda weird on xerox's part cuz you have to specify the paper size in 2 places. It took me a while to find advanced paper settings and I was just about ready to throw in the towel. Funny thing is I don't have to go through this same process to print from illustrator to the xerox printer. I am having the same issue on a Xerox 7845 Workgroup Printer but I don't have an "Advanced Paper Selection" option in my Xerox Dialog box. I have looked everywhere and even when I specify Tabloid it still prints and preview letter. I was able to export to a PDF and then print form there but it is a workaround that is slow and cumbersome. I should be able to print tabloid from Photoshop CS6 with not issues. Seems like a Xerox Printer Driver Issue. Mine works fine in Illustrator too. It seems to be working when I choose a paper size it now changes like it should without having to go through all of those steps. 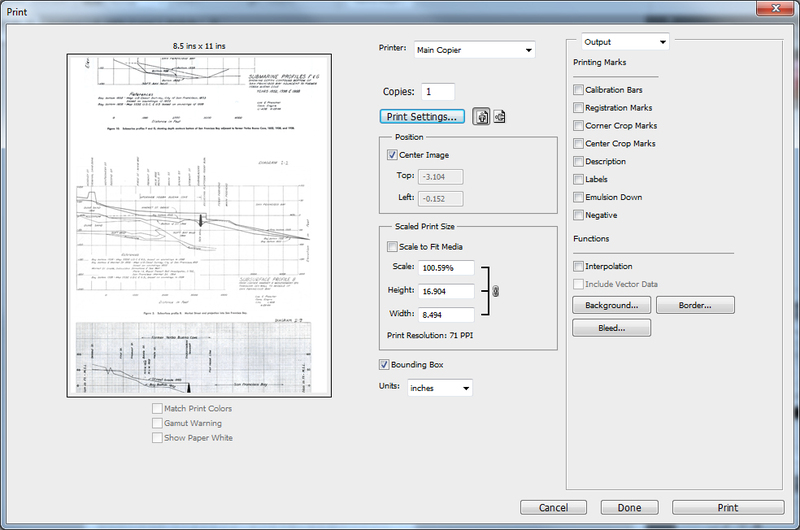 Specify the Size in the "Output Paper size" AND the "Original Document Size" inputs.